Colorado Territory, a remake of the High Sierra plot, is an early masterpiece of the pessimistic Western. It retains the High Sierra story and works variations on most of that film’s characters. But some significant changes are also made and the result, on the whole, is much more impressive. While High Sierra was set at the end of Dillinger-style gangsterism, Colorado Territory is given a setting that evokes the end of the Wild West. The Bogart figure is now Wes McQueen (Joel McCrea), “just a big Kansas jay,” escaping from jail and getting involved in one last train robbery. The Joan Leslie character becomes Julie Ann Winslow (Dorothy Malone), who is sexier and nastier than Velma was and who thus becomes a key to this version’s darker psychology. Velma’s father moves West for a better life and so does Julie Ann’s, but the latter’s dream paradise turns out to be a desert. The sentimentally symbolic dog of High Sierra is absent here, while the geographical symbolism is developed much more fully. Colorado (Virginia Mayo) is a disillusioned refugee of “the dancehall,” like her High Sierra counterpart (Ida Lupino), but here she is much more than a highly emotional spectator. High Sierra‘s cynical reporter (Jerome Cowan) is understandably missing here, but it’s intriguing to think of Brother Tomas (Frank Puglia), who watches over an all but abandoned mission, as his replacement. One of the most memorable scenes in High Sierra takes place when Roy Earle (Humphrey Bogart) is driving towards Camp Shaw high in the mountains of California after being released from prison. The camera sweeps the Sierra peaks and pans down to Earle’s car as he pauses at the junction of the dirt road leading to his destination. When he starts out we see him, the mountains, and a string of pack horses led by a couple of dude ranch cowboys who are moving slowly in the opposite direction, emerging from the world Roy Earle is about to enter. It is all somehow safe and reassuring, and yet in retrospect the image becomes a fatefully and fatally ironic premonition of Roy Earle’s death at the hands of a cowboy who perches on a rocky ledge above him and picks him off with a highpowered rifle and telescopic sight. The seemingly innocent picturesqueness of the scene perfectly indexes the illusory safety of the place to which Roy Earle is retreating, at the same time it suggests one of many aspects of the mortality which stalks through the movie. Walsh doesn’t invoke that oddly incongruous cowboy image by mistake; Roy Earle, who is himself a mythic presence, is shot by a figure who not only seems to belong in some other corner of history but who might more comfortably inhabit a different cinematic genre. Cowboys shouldn’t be any more “real” than the ancient race of gangsters to which Roy and Big Mac belong, and yet it’s a cowboy who destroys the man and momentarily diminishes the mythic aura surrounding Roy Earle. In Gentleman Jim a basic premise of the humor is that a good face-to-face brawl is one of the things that make life worth living. Here the physical and the sensual are a good deal less destructive than in White Heat and a good deal more pervasive than in Me and My Gal and The Bowery. Seen alongside The Roaring Twenties and White Heat, this movie’s celebration of turn-of-the-century urban vigor establishes it as a vision, imaginary or otherwise, of a time when personal wholeness and physical joy were much more accessible and more fully communal. But the conflict between eros and civilization turns up again, largely in the form of a refined young lady, Victoria Ware (Alexis Smith), who watches “Gentleman Jim” (Errol Flynn) performing on a theatre stage and wonders aloud why anyone would pay good money to see this guy—a bankteller turned boxer—as an actor. The question is a bit of an in-joke and the answer, of course, lies in Flynn himself: he may or may not be much of an actor, but he has great physical appeal. Vicki Ware and Jim Corbett are at odds through much of the film, but their sexual antagonism doesn’t boil over into romance until her hitherto-verbal belligerence begins to assume tones that are more physical and less uninhibited. Up to that point, their relationship seems a function of their differing responses to Vicki’s remark that “After all, we all started out in the same wooden washtub.” She means this only in a snootily abstract way, as an affirmation of democratic principle, but he takes it in a wholly physical sense, as an unbuttoned acceptance of skin-to-skin pleasures. While The Roaring Twenties is hardly a definitive history of an era, its chronicle of the intersecting careers of Eddie Bartlett (James Cagney) and two buddies from the Great War has a sharp bite socially and more than a touch of tragic vision. Here as elsewhere, the Cagney character is the focal point of a deadly disparity between society and the man who lives by his instincts, and the elegiac tone which the film builds around him is a way of paying respects not to a bygone era, but to a naïvely vigorous man on whom time and change have tromped. Here the “Roaring Twenties” are more or less what happens in between an era that sets a man up (World War I) and an era that tears him down (the Depression), and the ultimate effect is one of waste, of quintessential vitality (Bartlett’s) squandered in a age too confused to find a place for it. In one sense the film spells out the limitations of Cagney’s film persona; but the downward spiral of Eddie Bartlett’s career and the upward spiral of his lawyer pal’s (from bootleg bookkeeper to assistant D.A.) also suggest that society’s values move in brutally indiscriminate character’s inability to find a suitable companion in life ultimately constitutes an important, though tacit, social problem as well. What Price Glory?, like the successful play from which it is drawn, works with some of the era’s anger is directed less toward war itself than toward some of the era’s topical themes—in particular, as the title implies, the disillusionment that had befallen many of the youthful participants in World War I. But especially as directed by Raoul Walsh, the film version thrives on comedy that is sometimes satirical and often ribald. And that comedy only occasionally intersects with the anti-war feeling implied in the title. Eileen Bowser has written that the film is “the archetypal celebration of war as a game played by roistering comrades.” Certainly, the central Flagg-Quirt relationship, with combative friendship and devotion to duty as its key elements, seems to work in that direction. But while the film never approaches the radical disgust that Dos Passos, Hemingway, Céline and others expressed toward the war, it does evoke a more complex and less romanticized attitude than Bowser indicates. The warriors—some of them, anyway—are romanticized, but the war isn’t, one of the results of which is an interesting tension between personal flamboyance and public destruction. My contributions to MTN#45 (the “Raoul Walsh issue”) were riding the crest of what was, at the time, my freshly discovered enthusiasm for Warner Brothers films of the Thirties and Forties, including especially William A. Wellman’s pictures from the pre-Code era, Raoul Walsh’s films from some of the best years of his career (1939-1949), and almost anything with James Cagney in it. I’d already written about some of this in “Life with Warners” (MTN#6). Me and My Gal (Fox, 1932) and Gentleman Jim (Warner Brothers, 1942), first encountered amid a wonderful flood of studio-vault re-releases circa 1970, were the tipping points for my ventures into Walsh territory. Interviewer: One critic, Andrew Sarris, has said, “The Walshian hero is less interested in the why or the how than in the what. He is always plunging into the unknown, and he is never too sure what he will find there.” Do you feel that’s too precious a criticism, or that it’s on the nail? Raoul Walsh: I guess it’s so. Everyone has his own impression of things. Maybe the guy was drunk. In Manpower, a movie about powerline repairmen, there’s a funny scene at a diner. Various workmen are ordering their meals. The counterman shouts each order back to the cook, but—in the time-honored tradition of the American greasy spoon—he translates each request into the surrealistic lingo of short-order chefs. A cup of coffee with cream is “a blackout, and blitz it!” A hamburger to go is a “cow and convoy”; a bowl of chili “with plenty of peppers”—”one Mexican heartburn.” A cut of beef, “juicy and with no fat” = “one impossible”; hash is “take a chance”; and a bowl of cherries, “one George Washington!” Some comedy involving a slot machine intervenes, but the camera returns to the counter where the head lineman, thinking of his wife, makes a request of his own: “Gimme a nice little bottle of wine—and giftwrap it.” The counterman turns toward the kitchen and, facing the camera in closeup, shouts, “The grapes of wrath—in a sport jacket!” End of scene. 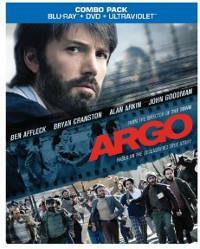 Argo (Warner), the third feature from actor-turned-director Ben Affleck, was released early in October, just before the traditional roll-out of high-toned dramas and Oscar-bait showpieces gets aggressively competitive, and debuted to glowing reviews, enthusiastic audiences, and impressive box-office. Pretty good for a real-life drama about the stranger-than-fiction rescue of the six Americans who escaped capture when Iranians stormed the U.S. Embassy and took American hostages. But then it’s a savvy picture that takes a few liberties with the historical record to create a nail-biter of an escape thriller. It was an early Oscar favorite, then lost momentum as the season rolled ahead and competition heated up. For reasons still not clear, Ben Affleck was passed over as a Best Director nominee and even though the film snagged seven Oscar nominations – an impressive count by anyone’s standards – it seemed to have lost its luster. Then it caught its second wind: a Best Director award from the DGA, Best Director and Best Picture Golden Globes, an award for the ensemble cast from the Screen Actors Guild, and BAFTA wins for Best Picture and Best Director. Now, as handicappers tip “Argo” as for the Best Picture Oscar, it arrives on disc and digital delivery less than a week before the Academy Awards. Awards hype aside, Argo is a terrific piece of filmmaking. Not Zero Dark Thirty brilliance or Life of Pi beauty, mind you, but a solid, well-made film with personality, humor, drama, tension, and a superb sense of time and place. Affleck and screenwriter Chris Terrio establish the era and the complicated history that created the Iranian situation smartly and efficiently, and Affleck seamlessly combines actual news footage with recreations that segue into the story at hand. And while I’m not convinced that the escape-movie contrivances that drive the film’s final act necessary to communicate the stakes of this mad plan, there is something oddly appropriate in the way this meeting of Hollywood fakery and true-story spycraft plays out like a movie. 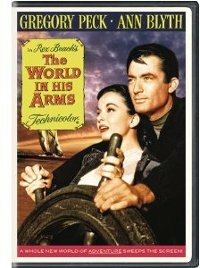 In the 1952 adventure The World In His Arms, Gregory Peck is a boisterous sea captain in the Pacific Coast, circa 1850, who has a plan to buy Alaska from the Russians… if they don’t kill him first. It’s not the kind of role that we immediately associate with Peck. He’s the man of principle, the dedicated father, the unbendingly loyal leader, protective and modest and unyielding in face of injustice, and still quite charming under all that poised decency. That’s the man we know from films ranging from The Yearling to Twelve O’Clock High to The Big Country to To Kill a Mockingbird. He could be stiff but his stiffness was part of the charm. But he was also a studio star who made his share of westerns, war films, adventures and romantic comedies, and he could put that smile and poise to work as a man of action with the best of them. The World in His Arms, adapted from the Rex Beach novel by Borden Chase (Red River) and produced by Aaron Rosenburg, Universal’s man for dynamic outdoor adventure, lets Peck be the maverick entrepreneur in the wild far west of the Barbary Coast and the Bering Straight. Imagine the rebellious kid brother of Peck’s Horatio Hornblower (another Walsh collaboration), rejecting the discipline of Her majesty’s Navy and gone to the New World for the freedom of free enterprise in a country without limits. The captain of a fast ship and a lovably roughneck crew that he gives free reign to let loose in their San Francisco shore leave between trips, he’s “the Man From Boston,” the nickname that the Russians have given him (along with the brand of “pirate”) for his wildcatting success in their waters. He’s still got that educated diction and East Coast culture in his voice and his bearing, but he’s also happy roughneck. He leaps into bar brawls, arm wrestles Anthony Quinn and romances Ann Blyth, Hollywood’s tiny porcelain doll of a leading lady playing a pampered Russian countess who comes alive in Peck’s big arms. The story is terrific Hollywood hockum, with the bad boy Peck as the spirit of American can-do action and a model of respect for the natural balance—he’s not just the most successful seal trapper on the West Coast, he’s also a proponent of responsible thinning of the seal herds, in stark, proto-ecosavvy contrast the Russians who are decimating the population—and this two-fisted adventurer is the perfect mate to bring the Russian aristocrat into the great American melting pot. There are larger than life accents (Anthony does his lovable rogue as “the Portugee,” a genuine crook who is still somehow welcomed into the brethren and invited to fight side by side against the “true” crooks of imperial despotism), lively clashes between the classes and revolutionary action as a fun-loving brawl that the Americans are destined to win. 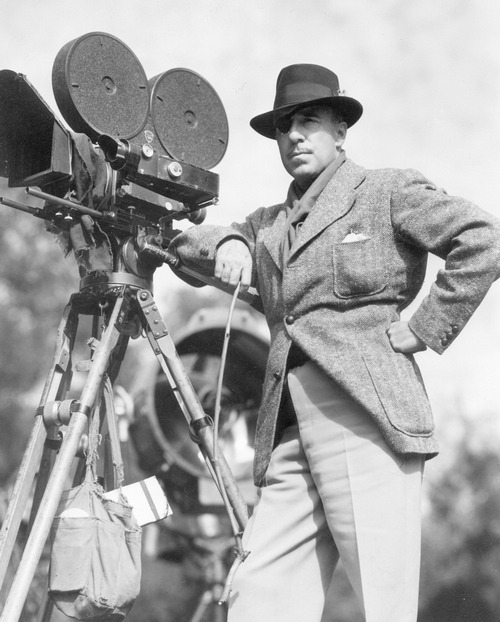 Raoul Walsh is Hollywood’s great director of men in action; his characters are defined by what they do and how they do it and Peck is nothing if not a man who acts from his heart. And while the film resorts to some clumsy back projection for a number of the more exotic backdrops, the film’s most thrilling sequence — a race to Alaska between rival sailing ships — offers us the real thing with dramatic photography of men and vessels fighting the choppy seas. If Barbara Stanwyck was the Queen B of film noir (as she was dubbed in an iconic issue of Film Comment), Ida Lupino was its tough cookie, a beauty with brass and a dame who knew the score. She was a romantic heroine who could hold her own against the brawny heroes and rough villains of Warner Bros. crime movies without losing her sexiness or her independence. And she was arguably at her best when directed by Raoul Walsh, who made her a mad femme fatale in They Drive By Night (1940) before bringing out her potential as a scuffed survivor with a true heart in High Sierra (1941), their third film together and her first real signature performance as the modern Lupino. They reunited for their fourth and final collaboration in 1947 with a a refreshingly mature film rich with stories of frustrated lives, unrequited loves and tough times just getting by in the world without selling your soul. It may be stretching definitions to call The Man I Love a true film noir—it’s not a crime film per se, though it is far more than a typical melodrama, thanks in large part to the strong, tough direction of Raoul Walsh, and for all the nocturnal lives it lacks the shadowy style that informs the genre. Yet this 1947 film, set in the post-war era of swank nightclubs and the seedy types they attract, is seeped in the post-war sensibility and it gives Lupino the confidence and control and narrative command usually reserved for men. Lupino’s calloused heroine is a New York chanteuse who goes home to Los Angeles to see her family: a married sister with a child and a soldier husband in the hospital for shellshock, a sweet younger sister infatuated with the married man next door and a cocky brother who sees his future as a hired thug for sleazy nightclub lothario Robert Alda. Lupino knows her way around the octopus hands of night club operators and puts herself between Alda and her family to save their innocence from the urban corruption that threatens to seep into their lives.